Engraving of ابو سہل الکوہی's perfect compass to draw conic sections. ↑ Katz (1993): "A complete history of mathematics of medieval islam cannot yet be written, since so many of these Arabic manuscripts lie unstudied.۔۔ Still, the general outline.۔۔ is known. 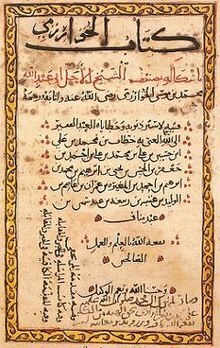 In particular, Islamic mathematicians fully developed the decimal place-value number system to include decimal fractions, systematised the study of algebra and began to consider the relationship between algebra and geometry, studied and made advances on the major Greek geometrical treatises of Euclid, Archimedes, and Apollonius, and made significant improvements in plane and spherical geometry." Smith (1958) Vol. 1, Chapter VII.4: "In a general way it may be said that the Golden Age of Arabian mathematics was confined largely to the 9th and 10th centuries; that the world owes a great debt to Arab scholars for preserving and transmitting to posterity the classics of Greek mathematics; and that their work was chiefly that of transmission, although they developed considerable originality in algebra and showed some genius in their work in trigonometry." ↑ Adolph P. Yushkevich Ivan Van Sertima، Golden age of the Moor, Volume 11، Transaction Publishers، صفحہ 394، آئی ایس بی این 1-56000-581-5 "The Islamic mathematicians exercised a prolific influence on the development of science in Europe, enriched as much by their own discoveries as those they had inherited by the Greeks, the Indians, the Syrians, the Babylonians, etc." ↑ جان جے۔ اوکونر؛ ایڈمنڈ ایف۔ روبرٹسن، "al-Marrakushi ibn Al-Banna"، مک ٹیوٹر ہسٹری آف میتھ میٹکس آرکائیو، یونیورسٹی آف سینٹ اینڈریوز . Adolf P. Youschkevitch؛ Rozenfeld, Boris A.، Die Mathematik der Länder des Ostens im Mittelalter، Berlin Sowjetische Beiträge zur Geschichte der Naturwissenschaft pp. 62–160. Høyrup, Jens۔ “The Formation of «Islamic Mathematics»: Sources and Conditions”۔ Filosofi og Videnskabsteori på Roskilde Universitetscenter۔ 3. Række: Preprints og Reprints 1987 Nr. 1. کارل بروکلمان۔ Geschichte der Arabischen Litteratur۔ 1.–2. Band, 1.–3. Supplementband. Berlin: Emil Fischer, 1898, 1902; Leiden: Brill, 1937, 1938, 1942. جان جے۔ اوکونر؛ ایڈمنڈ ایف۔ روبرٹسن، "Arabic mathematics: forgotten brilliance? "، مک ٹیوٹر ہسٹری آف میتھ میٹکس آرکائیو، یونیورسٹی آف سینٹ اینڈریوز .